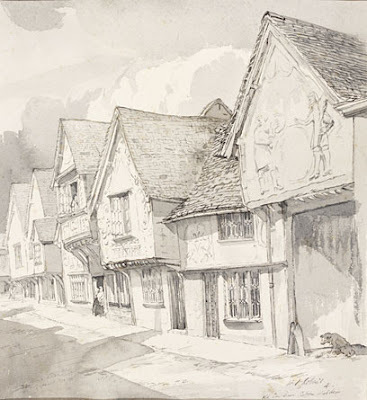 William Palmer Robins, 'The Old Sun Inn, Saffron Walden', watercolour, 1941. The Old Sun Inn at Saffron Walden in North East Essex, established in the fourteenth century, is one of the most illustrious inns in England. The diarist Samuel Pepys and the writer John Evelyn both recorded visits, and Oliver Cromwell is said to have stayed there during the Civil War. It is especially renowned for the ornate plasterwork, or 'pargetting', on its facade, depicting the legendary figures of Tom Hickathrift and the Wisbech Giant. Although the Sun is no longer an inn, the building survives today, housing an antique shop. It was to this wonderful old building that we repaired after a poke about amongst the rusty old iron on offer from Steve, the toolseller, in the market place (I think this is where a lot of my collection came from!). Managed to spot a couple of interesting books which I haven't seen before. The first was . 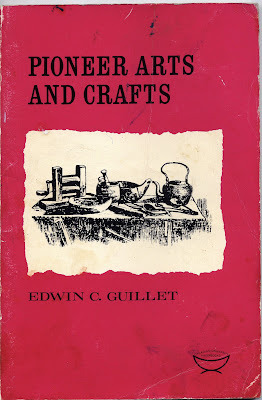 . .
All kinds of techniques used by the early settlers are described and throughout there are quotations from contemporary journals and anecdotes about various personalities. 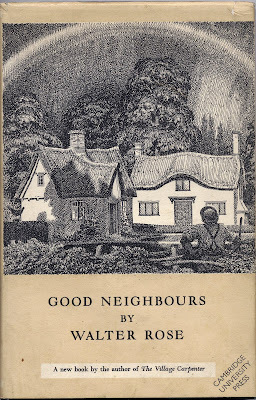 Then Good Neighbours - the new (in 1942) book by Walter Rose author of The Village Carpenter. Of course I have the Village Carpenter it's a lovely book and I've read it many times. I knew that he had written another - and there it was for only £3.50. I love that moment when you're browsing and suddenly something leaps out of the shelves saying "Here I am !" And finally a 1st ed. of this seminal work . . . I already have a copy but it was in such good condition for a 60 year old book - doesn't even look like it's ever been opened. So now I've got a spare - any offers ? PS. Some of the antiques on offer at The Sun Inn look like they could have been around since it was built or at least from Cromwell's time ! It sounds like you had my kind of day...good place to visit and books to bring home. It's nice to know I'm not the only one who buys multiples to. I must have twenty (different) copies of 1066 & All THAT...why? Dunno! 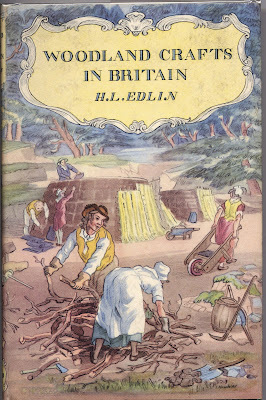 I think I have the Edlin, but if not I'll make you an offer.